This is a quick start guide to install a DEXGate2. GPRS (only DEXGate2-3G), connecting the 3G antenna into the connector next to the RS232 port. Then, insert the SIM into the slot on the top of the datalogger. Just enter the password to join the network (default password is the DEXGate2 identifier in capital letters), open your web browser and access http://172.16.0.1. DEXGate2 uses the UDP port 123 to syncronize the time*. Fill the form introducing a Name of your choice, and the serial number of the DEXGate2 in lowercase. You can find it under System > Status menu or checking the name of the WiFi you are connected on (DEXGate_XXXXX) where XXXXX is the serial number. At this point, if you have connection to the internet, you may have remote access to the DEXGate2 from DEXCell. 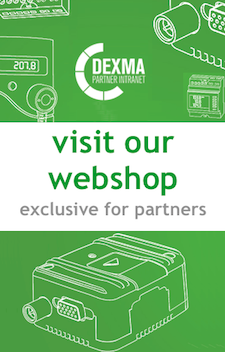 Go to Diagnostic > Remote support and check if the DEXGate2 is connected to DEXMA VPN. If not, click on connect. You can configure the bridge through the web administration interface. If you're using an IEC 870-5-102 fiscal meter you have to fill the config file at IEC 870-5-102 > Configuration with the meter's communication parameters (Link address, Measure point, Password, Speed, Parity).